©1997-2019 paul-f.com. All rights reserved. 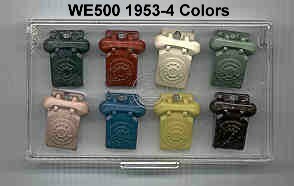 500 Set Colors G Handsets When Was My Phone Built? Contributors -- Many Thanks! 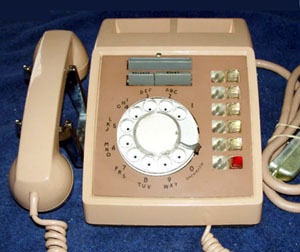 The 500 series was introduced in 1949 and made by the Bell System until 1986. Its design was licensed to ITT in 1951 and other manufacturers during the 50s, until it became the standard. 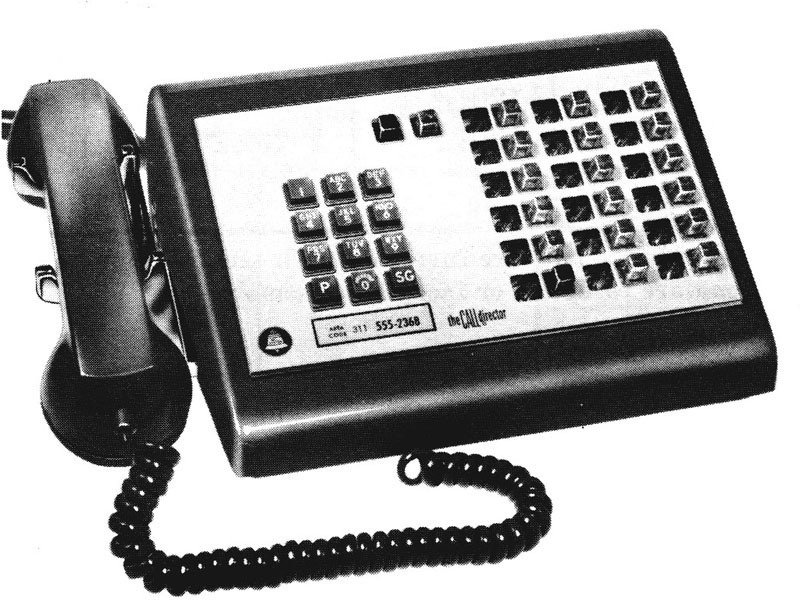 With the later addition of TouchTone, it evolved into the 1500 (10-button keypad), 2500 (12-button keypad), and 3500 (16-button Autovon military keypad) with similar model numbers. Over the years, numerous variations were made with extra switches, knobs and internal components for special purposes. Model numbers well above the 5xx range were ultimately used. Western catalogs and technical documentation only show the models that were in production or service at the publication date. To understand the full scope of models produced we must compile data from many years of documents. "How many 500-series models did Western Electric make?" The question was first posed to Antique Telephone Collectors Association (ATCA) and Telephone Collectors International (TCI) members, and other dealers and collectors in early 1997. Following are the results to date (no claims are made as to accuracy or completeness). For more information, see the 60th anniversary articles on the 500-series evolution published in the TCI journal, Singing Wires, from January thru August, 2009. >> Table Organization: Sorted by model number for the rotary variations. >> Use: Search (usually Control-F in most browsers) for the last 3 digits of the model number of your set. Or Browse by category, using the links above. Note: the Control-F search only works for models on this page. For Touch Tone models, use the links above to go to the appropriate page, then search. Find the model number of your phone on the bottom plate. In this case, look up 500C or 500D. More on model numbers here. Vermillion ink or other codes stamped on the bottom may indicate that the phone was refurbished. 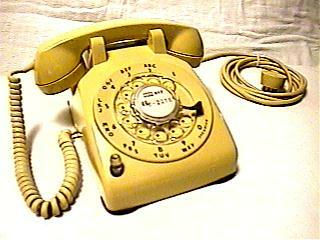 Manual Sets (sets without dials) had an "apparatus blank" filling the hole in the housing normally occupied by a dial. For more info, go to 500blanks.html. Early 500C with soft plastic housing and 95A blank. Later 500C with hard plastic housing and 95B blank. Looking up the model number for your set should give you a brief description of the major features of the model, and a BSP (Bell System Practices) reference for the rotary set, if known. When available, photos of some unique features are shown near the model number or linked from the chart entry. 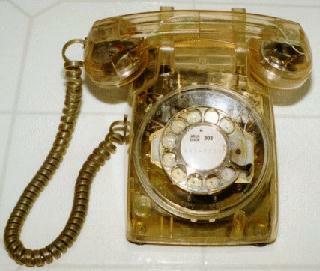 If you don't find your model listed, try looking up the last 3 digits in the tables for other Western Electric models. Often the major features were consistent among rotary and Touch Tone models. The BSPs provide technical details and usually a wiring diagram. BSPs are often found in the Station Service Manuals, Key Systems Service Manuals and Station Specialties Service Manuals published in the 1970s and early 80s. BSPs or wiring diagrams for some common models are available on several internet sites including the ATCA and TCI club sites. Several club members have scanned some popular BSPs and make them available on CD. For more details on BSPs, click here. You still need to check the internal components as many phones were refurbed and had internal components changed or removed. 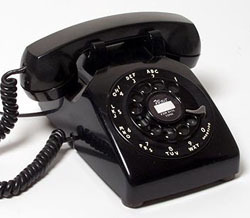 For example, many phones marked 501D were converted from party line to single line (500D) by removing the 426A tube as party lines lost favor. If done in a Bell System refurb facility, the code on the bottom was usually repainted or remarked. Many independent shops or field mods were not remarked with the accurate model number. Check out the table key for model numbering background and other reference details. NOTE: see Table Key for prefix and suffix codes and reference info. Earliest 500 sets were not marked with suffix codes. 500 and date were stamped in ink, usually along the front edge of the baseplate. 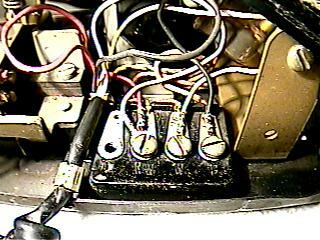 w/ 425A net & amp; separate 311A equalizer.First production used C2A ringer, then C4A. Note: There were no seperate model numbers for manual and dial versions. Replaced by the 500A and 500B -- often the A/B was added to the existing 500 marking during refurb. Early single line w/ 425A net & amp; separate 311A equalizer. Model and date moved to a location near the ringer, near where the word “LOUD” was stamped. See Photo. Note: Bases were marked 500 A/B. This is a manufacturing code, not the model number. See the table key for details. Replaced by the 500C and 500D. Replaced the 500A, 500B, 500J and 500K sets. This is by far the most popular variation and was made for decades. Single line w/ plunger switch to avoid interference on extensions (or party lines). Lifting the left plunger activates talk and dial circuits. 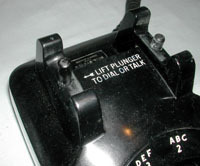 Cradle is marked, “LIFT PLUNGER TO DIAL OR TALK”. Replacing the handset resets the switches. Replaces the 302AA/AC. Single line w/ hooded dial lamp (GE46 bulb, 6-8v ac or dc supply, P17A120 lamp cap assembly [contact me if you have spares of this part! ]), 425B network (or later 425E). The light is only activated when the handset is offhook. Cannot be used as the tip party on message rate, automatic ticketing, automatic message accounting or zone restriction services. Replaced by the 500P and U for these services. Single line w/ 425A net w/o equalizer. Replaced the 500T. Many 500T sets were remarked 500 J/K during refurb. Single line w/ A-lead control for 1A2. 4-conductor mounting cord and terminal strip installed below dial. Originally used in applications where the ringer circuit had to be brought out through the mounting cord. Replaced the 500H to overcome limitations of that set. Compatible with all services supported by the 500D. See also the 500U, with night light feature. 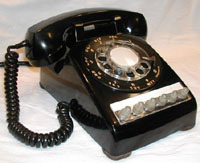 Early single line w/ 425A net, no equalizer, but terminal block for handset leads. Use was limited to zones distant from the Central Office, where the attenuating characteristics of the equalizer in the 500 set was not needed. This was a cost saving measure. Replaced by the 500J and 500K. Single line w/ hooded dial lamp (GE46 bulb, 6-8v ac or dc supply, P17A120 lamp cap assembly [contact me if you have spares of this part!]). 425B network (or later 425E). Similar to the 500P with the addition of a night light switch (584A key). When switched on, the night light glows dimly when handset is on hook and a full brilliance when off hook. See Photo. The 500H and 500P sets (above) did not have the turn switch on the lower left. Single line w/ neon ringing/message waiting lamp for PBX. Available in 1958. 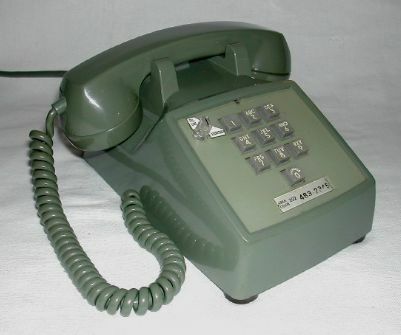 Uses included room phones in hotels, motels and large apartment complexes, some sets had custom dial plate legends showing dialing instructions for services such as housekeeping, maintenance and local or long distance outgoing service. See photo of red cap and mount here. Single line for 2-wire or 4-wire circuits. Comes wired for 2-wire service but may be converted at installation to 4-wire service. Arranged for but not equipped with a KS-8109L2 Buzzer. Intended for use in 1A1 and 1A2 Key Telephone Systems and 3B Speakerphone Systems, however it is intended for specially engineered lines. Not for general telephone use. For touchtone model, see 2504 and 3504. Single line for 4-wire circuits and 3-type speakerphones. Arranged for 4-wire service and equipped with a switch hook arrangement which provides one spare transfer and two spare make contacts. The spare make contacts may be used for such purposes as controlling external relays or applying idle line circuit terminations. Arranged for but not equipped with a KS-8109L2 Buzzer. Intended for use in 1A1 and 1A2 Key Telephone Systems and 3B Speakerphone Systems. 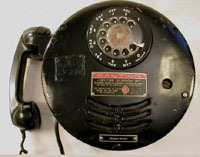 Single line with Military markings on case: Signal Corps US Army, Telephone Set TA236/FT, Western Electric. For photos, see the corresponding sets in the table above. Earliest 501 A/B sets were not marked with suffix codes. 501 and date were stamped in ink, usually along the front edge of the baseplate. w/ separate equalizer. First production used C3A ringer, then C4A. Replaced by the 501A and 501B -- often the A/B was added to the existing 501 marking during refurb. Early party line w/ separate equalizer. Later party line w/ varistors for equalization. Replaced the 501A, 501B, 501J and 501K sets. Party line w/ plunger switch to connect talk and dial circuits - to avoid interference with talking party. Replaces the 306G. Cannot be used as the tip party on message rate, automatic ticketing, automatic message accounting or zone restriction services. Replaced by the 501P for these services. Party line w/ 425A net w/o equalizer. Replaced the 501T. Many 501T sets were remarked 501 J/K during refurb. Replaced by the 501 C and 501D. 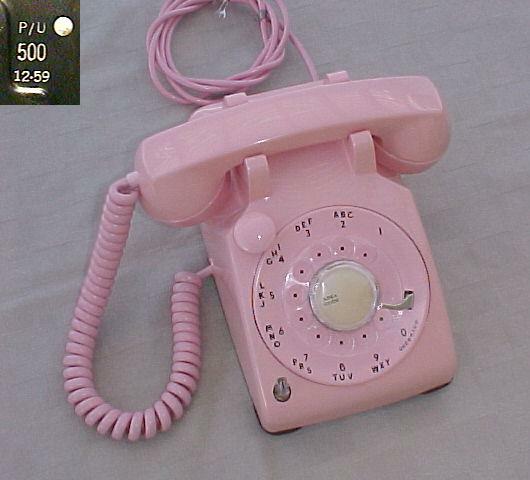 Party line w/ dial lamp. Replaced the 500H with tube. Early Party line w/ 425A net, no equalizer, but terminal block for handset leads. Use was limited to zones distant from the Central Office, where the attenuating characteristics of the equalizer in the 501 set was not needed. This was a cost saving measure. Replaced by the 501J and 501K. Single line used with Data-Phone equipment, with exclusion key. 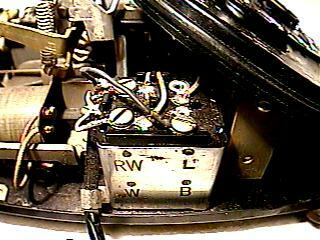 w/ signal key, 6-conductor mounting cord See Photo. 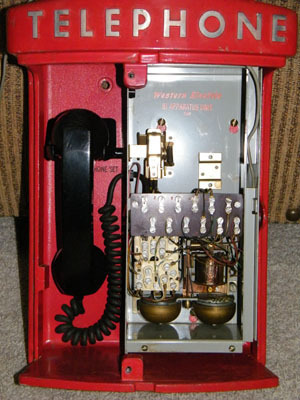 Also used on early PBX systems with the switch wired to provide “ground start” during power failures. Voice Coupling using 30A Voice Coupler. Provides 2-wire connection of customer-provided voice transmitting and/or receiving equipment to Bell lines, DC isolation and limits excessive line signal. Has a standard ¼” phone plug on the right side. Connection is made by operating the exclusion key. w/test key and lamp. Mounting cord plugs into the J1D401F data set. Exclusion key (left plunger) transfers set between voice and data modes. Lamp illuminates when test mode is operating. Single line with headset jack in back and headset mode/recall switch above right of dial. 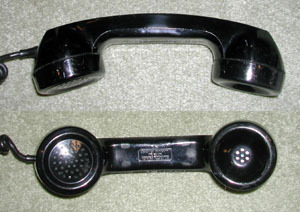 Ringer loudness control on left side behind handset cord cutout. Message waiting lamp optional with D-17998 kit of parts. Single line w/ industrial round wall enclosure. G11A or C handset. Mounted on a panel with the handset recessed. for outdoor use, complete. Based on 325 set design. Uses optional KS-8028 lock with skeleton key. Note: The same housing is also used for the 695-type subset, which has just a handset, switchhook and terminal strip inside. See 502-201-102.
for outdoor use, sold as components. Also marked with a "Faceplate Code Number" of 253A or 253B with variation sub-codes. No network, 12 conductor cord for 101- and 102-key equipment. Available in black only. Replaced 329C set. 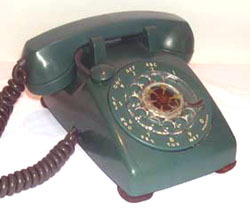 D12H-03 cord, 9P-03 dial, H1A ringer, G3AR-03 handset. Optional: KS-8109L2 buzzer, 152A capacitor, 61A filter. Single line w/ receiver amplification and volume control. 151A amplifier, 419A varistor, and P13A693 potentiometer. Party line w/ receiver amplification and volume control. 151B amplifier, 419A varistor, and P13A693 potentiometer. Single line w/ receiver amplification and push-to-listen button (G2 or G5 handset). It provides limited receiver amplification and limited reduction of transmitter and sidetone levels with the handset push-to-listen button normal. 151B amplifier, 419A varistor, P13A693 potentiometer, P-10C610 terminal block. Single line w/ speech amplification. Useful for whispered confidential conversations. 151B amplifier, 419A varistor, P13A693 potentiometer, P-10C652 terminal block and 266A inductor. 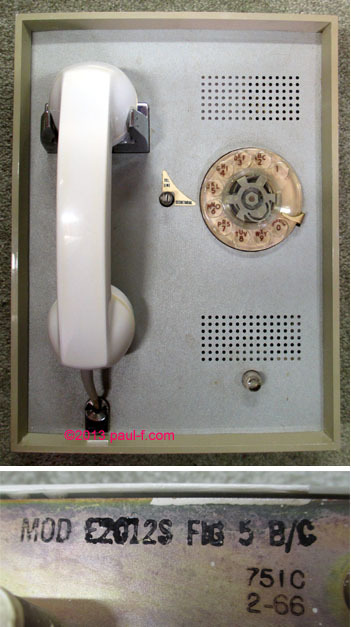 Rotary dial telephone e/w G5U handset, flush mount loudspeaker, battery test button, RCVR VOL pushbutton, emergency button. 12V dry cell battery for 3 months of average use. Mechanically rugged, portable, corrosion resistant, "sealed against 100-percent humidity and forceblown rock dust." (!!) Operates at -18 to 60 degrees C (0 - 140F). Meets requirements for "Intrinsic Safety" in Mineral Resources, Title 30, Part 23 (Telephone and Signaling Devices), UL Standard 913 and National Fire Protection Association 493. Approx. 18.58 in x 14.04 x 9.56. 28 Pounds. Single line wall w/ exclusion plunger on top. Announced in 1955 in black and ivory. 554 Modified for "Lift Plunger to Talk or Dial." Single line wall equipped with 9 foot handset cord. Two line wall w/ signal key. Above: Modified 558 with amplifier added. Functions like the 532 desk set above. w/ signal key, control leads and A-lead control for 1A2. 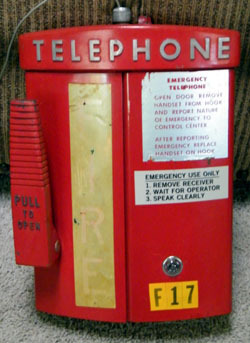 Large roadside "Emergency Reporting" or "Fire" set, manual only, Usually painted bright red or yellow. 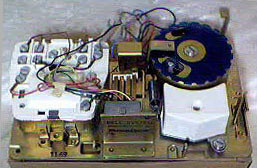 Cover removed to show internal components. Replaced F-55659 and F-56660. See photos. 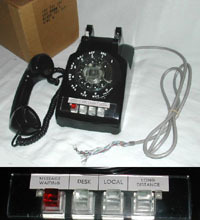 Desk set supplied to operating company with no Bell System markings or ringer -- for installation of a frequency selective ringer for party line use. "This is a desk type manual telephone set intended for use in the Command Post Alerting Network (COPAN)." Available only in yellow (-56) and light gray (-61)". 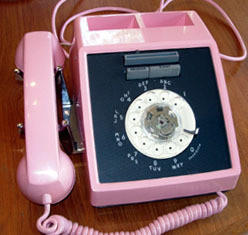 Manual set, 2 or 4 wire, manual 4-step ringer volume control, neon lamp equipped, ringer supplement, push to talk handset. Consists of: PTT handset (G5RR), hookswitch, C4A ringer, hook switch, dial blank, neon lamp and domed lens (in position of message waiting lamp on 500W/Y), 10 conductor mounting cord, no network. "Used in the (SAC) Strategic Air Command secondary and primary alerting systems." Desk manual set. Available in red (-53) only. The set has no ringer or network. 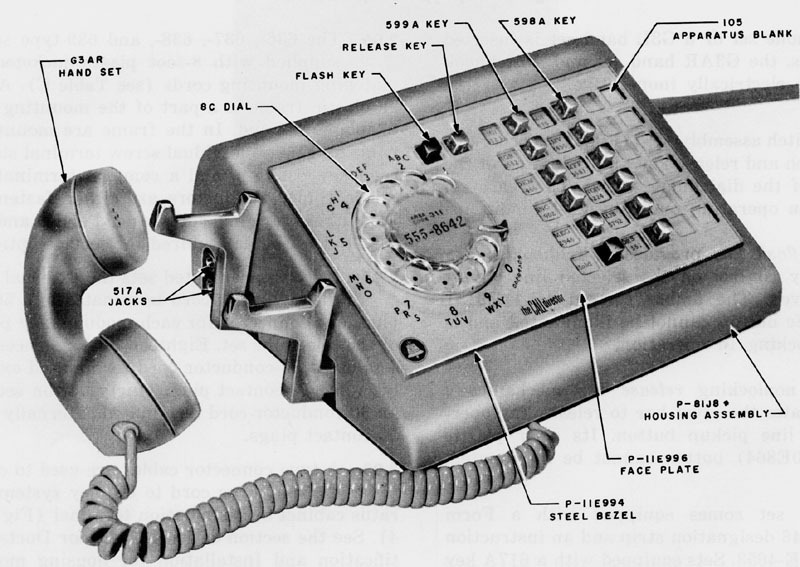 Just a handset (G3BR), hookswitch, terminal strip, dial blank, and a 6-conductor line cord. Used with 4-wire circuits. 500-series keysets announced in 1955. Designed for the small hotel/motel market, used in the guest rooms. Control buttons and "A-leads" (control leads) tell the switching equipment what kind of line to connect to the set (switching done within the PBX). 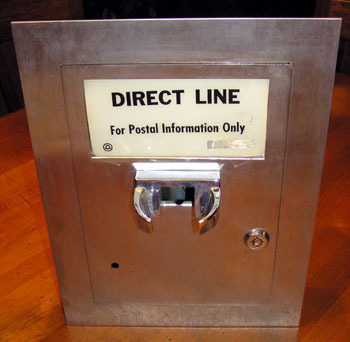 4 buttons marked "Message waiting" (the front desk could illuminate it to alert you to a message), "Desk" (connected you to the front desk), "Local" (connected you to a CO trunk for a local call), and "Long distance" (gave you a direct path to a toll operator). Only 3 of the 4 buttons depressed. These button features relieved the attendant of having to route much of the guest traffic. Outwardly, these sets look like a 544 or 545 set but have fewer line cord conductors (12). 543DBC – 588B line key, C4A ringer – field/distributor converted from 544BB or 545BB. 4-button, lighted buttons and exclusion. 6-button, non-lighted buttons and exclusion. 25-pair line cord. 6-button, headset connection. 25-pair line cord. HD: 30 or 34 conductor line cord. No lamp for HOLD key. HK/HL: 30 conductor line cord. No lamp for HOLD key. F-53149: 564HB modified with plug-ended mounting cord. 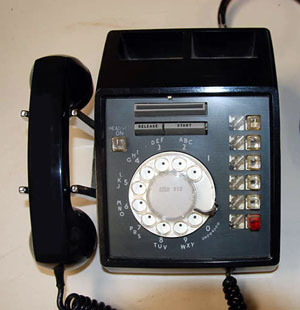 May be adapted to 750A PBX. Only one set of Tip and Ring go to the set, as line switching was done in the PBX. 6-button w/ exclusion (HB,HF,HR,HT) 2 or 4-wire operation (P25E963 relay assembly). HB has round buttons on the key strip and metal fingerwheel. HF replaced HB and has H1A ringer. HR replaced the HF and has N1A ringer with side-mounted volume control and case markings for LOUD and OFF, and a clear fingerwheel. Room for optional AC or DC operated buzzer. Early touchtone keyset (before 1500 numbering), relay for 2 or 4-wire operation. Has 22-type dial with P (Priority) and SG (Special Grade) buttons, and round line and hold buttons on key strip. Has square buttons on key pad. Available in black only. 568HB,HF,HR is the rotaty version. 2568HAA is a later 12-button touchtone model. Comkey 718, 734, 1434 and 2152. 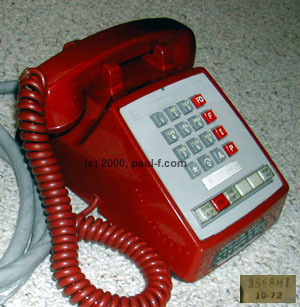 Red non-functioning key may be used for message waiting, 3 intercom line keys and 2 unused keys. 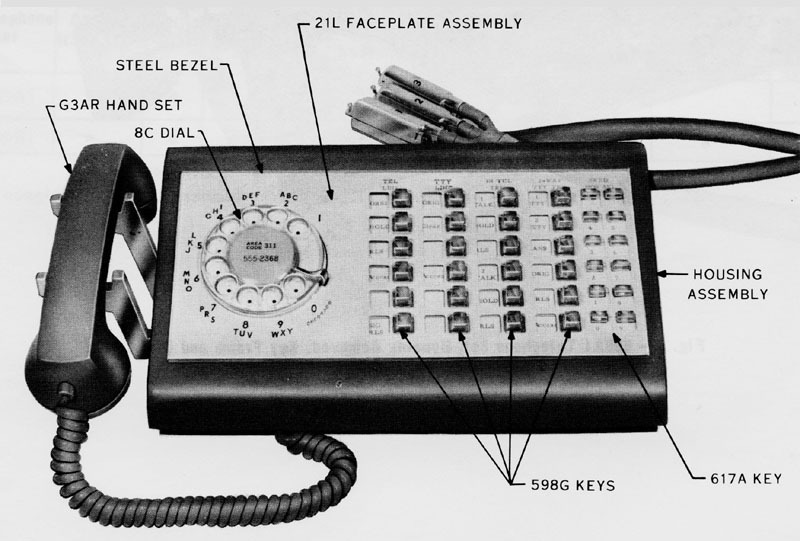 (CLICK IMAGE FOR LARGER VIEW) This section contains Call Director sets, which were introduced in 1958, and "Call Director-type" telephone sets and consoles made from similar components and contained in related BSPs. 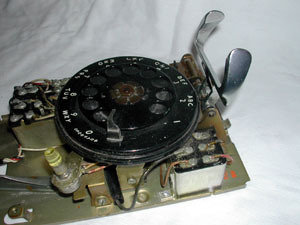 D1A Ringer (adjustment on front left of set), 6L dial. For 1A1 and 6A Key Telephone Systems, NOT 1A. Call Directors announced in 1958. 608C with headset jack, Flash and Release keys. For 1A1 or 1A2 Key Telephone Systems. 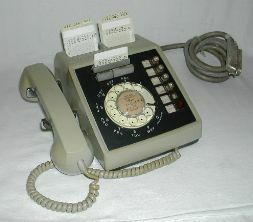 Call Director, used at supervisor desk with a dial TWX or WADS No. 6A teletypewriter switchboard. 589G keys (4) plus 617A Key. Call Director, 18-button, used with Switched Circuit Automatic Network (SCAN). 2- or 4-wire circuits, 1A1 or 1A2. Flash and Release keys. 22B TouchTone dial with P and SG keys (like the 568HT above.). Replaced by (renumbered to) the 1616 shown here. Call Director, 30-button, used in FAA installations. 2- or 4-wire circuits. Light Gray (-61). Call Director, 2 or 4-wire service. Headset jack, Flash and Release keys. Used by 701B PBX attendant. Used in No. 5 crossbar systems arranged for customer group service. Used with the recorded announcement frame of the No. 1 Electronic Switching System (ESS). 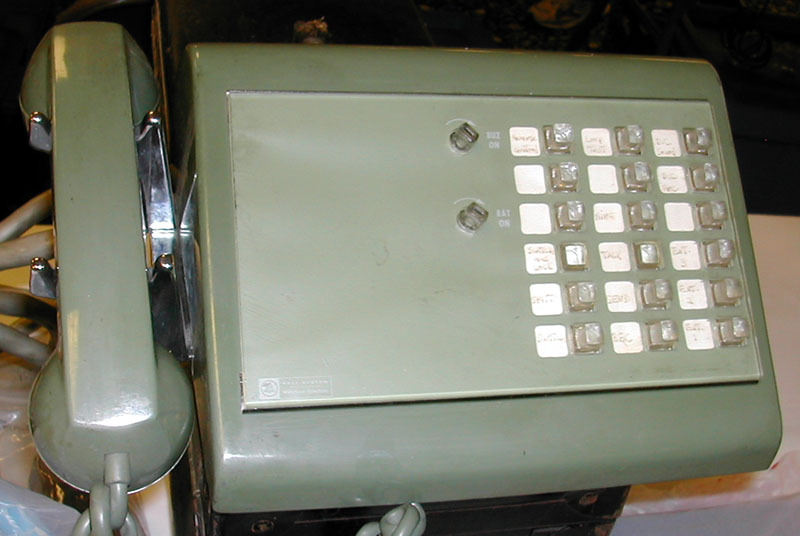 Call Director, used with the 110A key telephone system. No dial. Moss green (-51). Turnkeys for battery and buzzer. 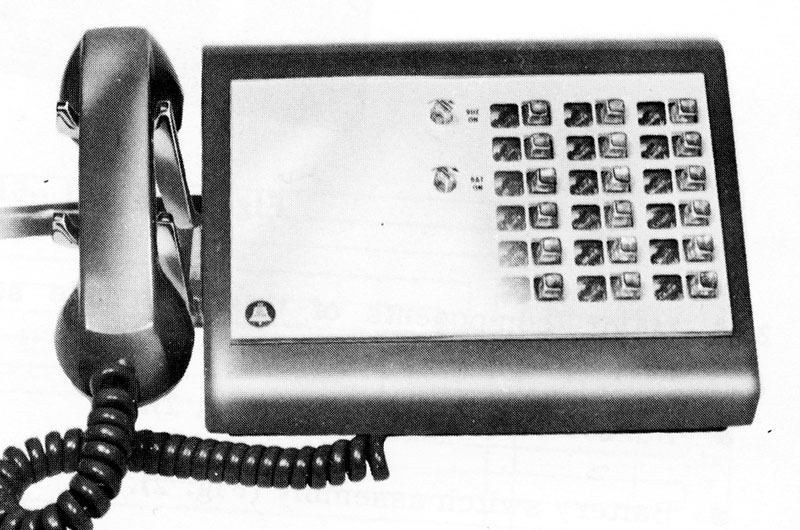 G5 push-to-talk handset. Uses "even count" color codes. For 1A, 1A1 and 6A Key Telephone Systems. 632 Call Director for "limited use"
For 1A1, 1A2 and 6A Key Telephone Systems, NOT 1A. 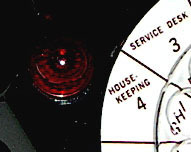 Flash and Release keys above dial. 151D amplifier. For 1A, 1A1, 1A2 and 6A Key Telephone Systems. For 1A1, 1A2 and 6A Key Telephone Systems. 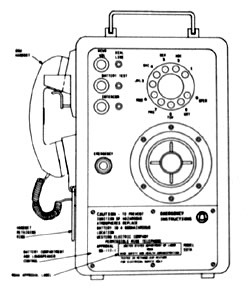 Call Director, used in the 11A Alerting System. Call Director, "Not for general telephone use. Shall not be used unless specified by service order." Call Director, for 2- or 4-wire operation. Subset used with data set 101A in Models 14, 15 and 19 teletypewriters. 6-button keyset. Has no hookswitch or transmitter element – uses 732A receiver (which looks like a G3 handset with no holes in the transmitter cap!). Keys marked ANS/CLEAR/ORIG/ /TEST/LOCAL. First 4 are momentary, last two lock. 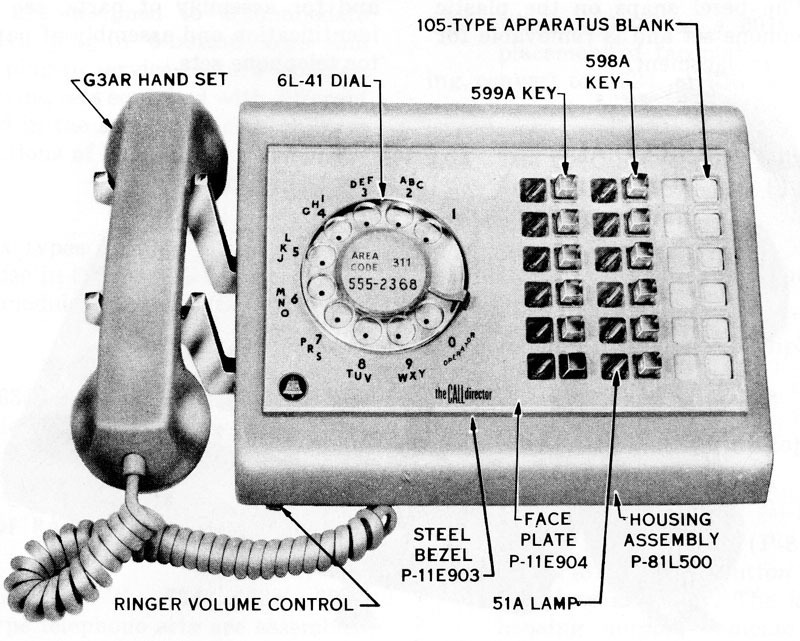 425F network, 7L dial with numbers-only plate, C4A ringer and 589S Key. Bottom plate marked, “SUB SET 691A”. See photos. 11-button sets have HOLD, 7 line pickup, 2 intercom lines and RECALL. Variations for both desk and wall mounting. HOLD, 14 line pickup, 3 intercom lines, RECALL and Privacy Release -OR- Ring Transfer. 10 key Direct Station Select field. Automatic Dialer - Uses plastic cards to store phone numbers to be automatically dialed. A lead control. Requires a low voltage external power supply for operation. 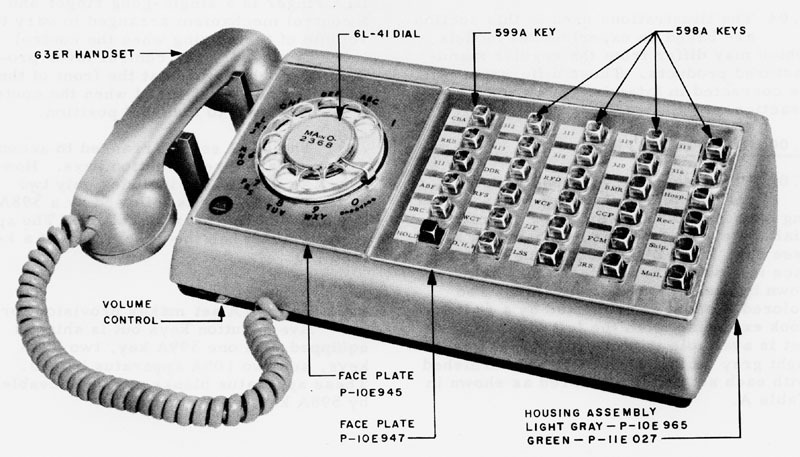 Card dialers announced in 1961. Keyset, 6-button Automatic Dialer - 40A dial, G1A ringer. 40A dial is polarity sensitive and operates from line current. No external power supply is needed. 41A dial is not polarity sensitive and requires a low voltage power supply that delivers 12.5-19 vac to the dial. 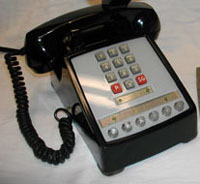 Automatic Dialer - wired for headset use, has 242-type amp, jack in back and turnswitch for ON/OFF control. Requires a low voltage external power supply for operation. Keyset, 6-button Automatic Dialer - wired for headset use, has 242-type amp, jack in back and turnswitch for ON/OFF control. Requires a low voltage external power supply for operation. 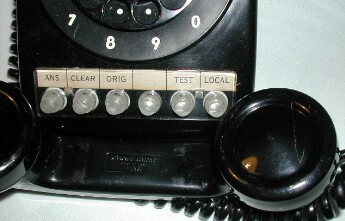 Automatic Dialer for 2 or 4-wire service. Requires a low voltage external power supply for operation. Mounted in a metal box recessed into the wall. Used on CO or PBX lines. Grill on front for ringer and knob for ringer adjustment. 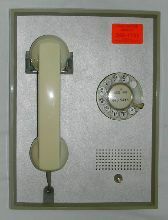 2-line panel phone with exclusion. Used on CO or PBX lines. Used on CO, PBX, 1A1 or 1A2 KTS lines. 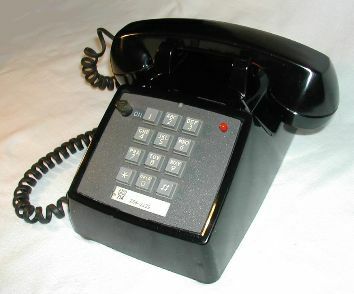 Panel phone with 3-type speakerphone. Armored, with armored cord (like a pay phone). Used in lobbies to communicate with tenants. MODEL Number Format = 5nnv, where 5nn=model number, and v indicates model variations. Many bases are marked on the bottom 5nn x/y (e.g. 500 C/D). This was a manufacturing convenience used where the same base component was used to build several different variations and is not the model number. Usually x=manual version (no dial) and y=with dial. 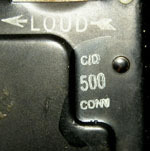 Model number 500C has an apparatus blank instead of a dial. Model number 500D has a dial. There are exceptions. The 500 P/U base was used to make the 500P or 500U sets, both of which have dials. Some bases are marked 500 P, some 500 U and some 500 P/U. • Many TouchTone models have similar numbers, with a prefix of 1, 2 or 3, e.g. 15nn x/y. CS: later models (1980s) which were customer-owned (including internal components), e.g. CS2500. e.g. 500DM - 500D, Modular. 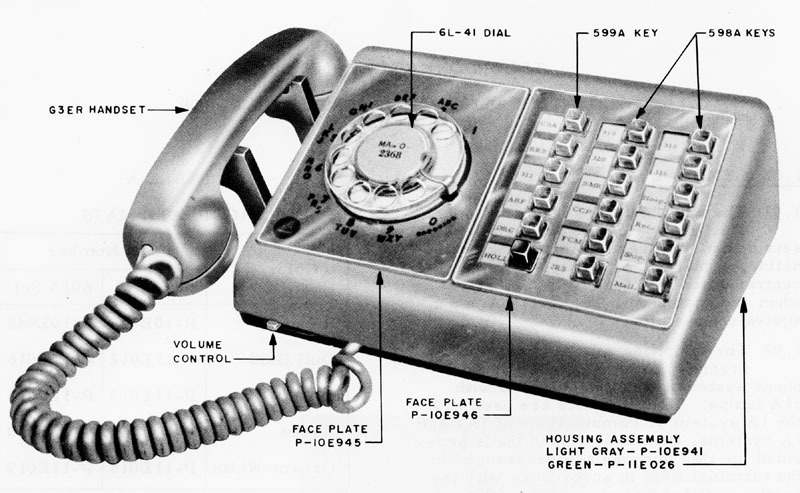 1M or 2M suffix indicated bases that were inventoried as components, separately from the color parts such as the housing and handset. This was done to economize on the size and weight of sets carried in the installers' trucks. Planned daily installations were stocked in the truck as fully assembled sets (e.g. 500DM). The installer could assemble a set of the proper color for an extra extension added to the order while on site using a 500D2M plus color kit plus cords. More info in BSP 503-100-100.
e.g. 2750AMG - 2750A panel, Modular, with Polarity Guard. e.g. 554BMP - 554B wall, Modular, with Wall Plug on back of set. e.g. 500UR - 500U with Retractile cord. e.g. 500ABMW - 500AB, Modular, Without Markings. 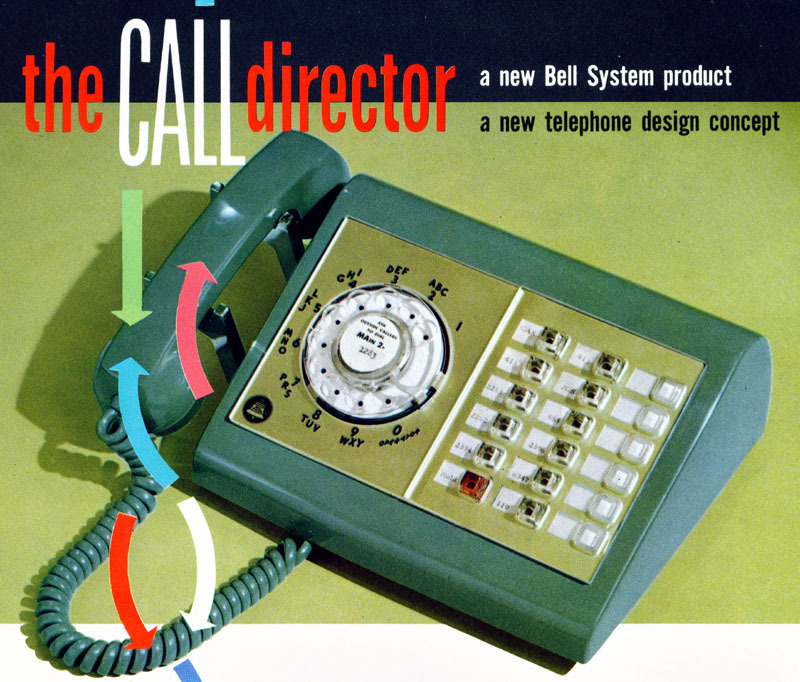 Handset handle and housing moldings eliminated any reference to the Bell System. e.g. 500D-54 (brown). For color list, see Colors.
? (in table entries) = Model identified, but feature description and reference still needed. Please help! • Note: WE made many models based on the 500 design with model numbers outside the range 500-599. The markings are usually found in the back right corner of the bottom plate -- either below or to the left of the ringer adjustment wheel. Note: date codes on the right two phones are in the form YYDDD, where YY is the last 2 digits of the year and DDD is the numeric day of the year (001-365). Their bases are cad plated, rather than the original black. Date codes changed format in about 1978 for 500-type sets and in about 1977 for Princess sets. 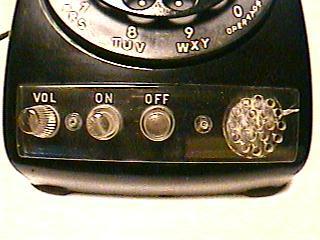 Western Electric bakelite and soft plastic receiver caps generally have 6 holes in a circle, and transmitter caps have three concentric circles of 6, 12 and 18 holes, for a total of 36. Hard plastic caps each have the same pattern with the addition of one hole in the center of the pattern. 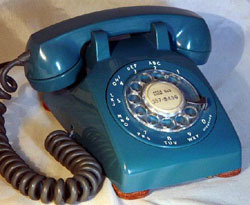 Note that caps were often changed in refurb, so are not a reliable indicator of handset plastic material. For example, soft plastic caps are often found on bakelite handles marked G1. 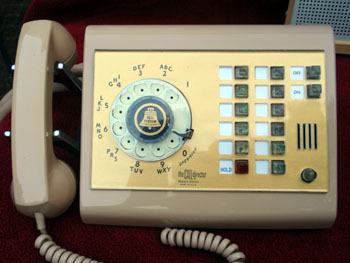 Handsets and bottom plates marked "Bell System Property, Not for Sale" (1968-1983). * Changes with Colored Sets starting in 1953: 7C dial, clear hookswitch plungers, clear plastic fingerwheel. Look for color code on the back of the 7C dials, e.g. 7C-59. Clear plastic fingerwheels were also used on black 500H, P and U sets. • WE also made specials for large customers (e.g. Howard Johnson). 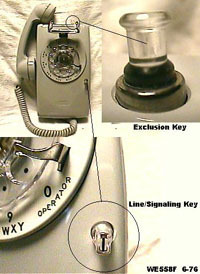 • Exclusion keys were wired for many purposes, including ringer cut-off, extension station cutoff, etc. WHEN WAS MY 500-TYPE SET BUILT? It's time for some detective work. Fortunately, Western Electric left a lot of clues for us to follow. Most components of the 500-series sets had both model numbers and dates. This was important for them, as the Bell System owned the phones at the time, and refurbished the sets to extend their useful lifetime. Most of the sets we find today were in service for many years and were probably refurbished at least once. Original components were replaced with the currently manufactured parts. Therefore, internal dates of the components do not always match. The dates that are the most important in establishing age are the date on the bottom plate and the date on the network. These two components were usually joined in the assembly process using rivets, so were difficult to change in refurb. If the dates match, that was most probably the assembly date of the phone. Other components used in the assembly would originally have had the same month code or perhaps a date a month or two earlier. Look at the model number and date information carefully, to make sure it hasn't been changed. Often, original dates have been painted over and new dates stamped . New code in vermillion ink. New code in silver ink. 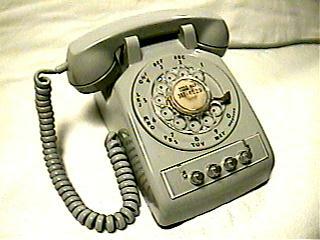 Parts such as the dial, ringer, cords, plastic housing and all handset components usually also have dates. These parts are real easy to change, so were often replaced during the phone's useful lifetime. If your phone has mixed dates, the interesting dates for it are the dates on the base and network, and the dates of the last refurb or newest component found. Another exercise for the phone sleuth is to try to determine what the original model number was, if the original model number had been painted over. Occasionally careful examination of the black paint will show a slight raised pattern caused by the original ink below. In other cases, remains of the previous model will be left in place. 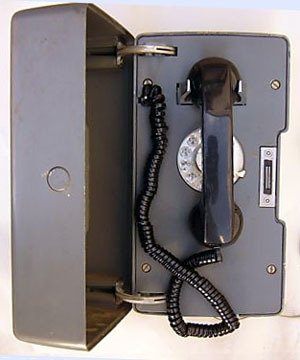 For example, looking inside the phone from the rightmost photo above revealed a terminal strip near the handset entry hole. Therefore the original set was probably a 500T, 500J or 500K. The original 425A network had been removed and replaced with a 425B. The terminal strip was left in place. Phones stamped "CONV" usually had the network replaced. The conversion was from the 425A to 425B. Now that you know how many models you need to collect, try finding them in all the following colors, by year!! Note: The first color name is typically the one found in the initial BSPs. Other names were used in marketing literature and often differed among the Operating Companies. Note: Dates are based on first appearance in marketing literature. Sets may be found dated the previous year. -50 Ivory, Cameo Ivory, Classic Ivory. -51 Green, Moss Green, Mistletoe Green, Sage Green, Colonial Green. -53 Red, Cherry Red, Cardinal Red, Fiesta Red. -56 Yellow, Canary Yellow, Sunlight Yellow, Pastel Yellow. Note that there are several model numbers within each type code, based on cord type and in some cases controls provided. Some information is presented in the chart, but see the BSPs for details. 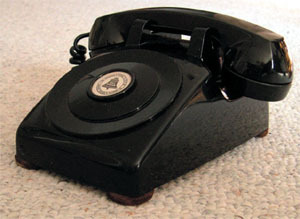 Early standard handset - Bakelite Housing and Caps, Black. Many were later refurbed with plastic caps (which are often hard to remove!) Replaced by G3. Some G1 handles were used to make GF handsets. See GF below. Models include: G1AR (500 sets), G1DR (PBX), G1FR (570-type sets), G1G (coin collectors), G1J (525A and B sets). G1B had an optional weight (RS-9099) for use with 190 series and lower coin collectors. Early push-to-talk/listen. Replaced by G5. 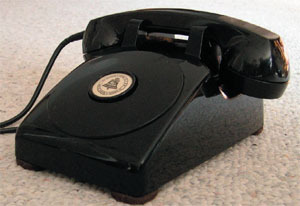 Later standard handset - Plastic Housing and Caps. Available in colors. Some G3 handles were used to make GF handsets. See GF below. with Shoulder Rest - fits into two holes on handle. Can be reversed to fit either right or left shoulder. See photos. Models include: G4AR (black only), G4B (colors), G4M (modular). Announced in 1954. Push-to-talk - Has a rectangular push-to-talk bar on the handgrip. Models include: G5AR (mobile radio), G5BR (4-wire circuits, paging),G5CR (FAA, private line systems), G5ER (535 set), G5FR (Bendix MRT9 radio), G5GR (2,4-wire private line stations), G5HR (102-type key equipment), G5JR (#300 switching system), G5KR (2A farm interphone), G5LR (617 set, COPAN), G5MR (Air-ground base station), G5NR (625-type set), G5PR,RR (596E set). Impaired Hearing - receiver amplifier and volume control in handset. G6B (late) and G6BM have a 0.02mf cap across terminals R and G. G6AR has a single stage transistorized amp. (See G66.) Introduced in 1961. 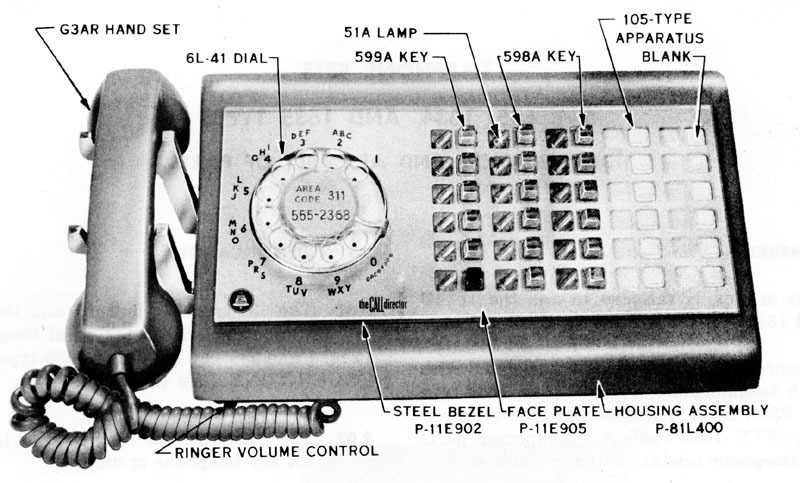 Weak Speech - transmitter amplifier and volume control in handset. Noisy Locations - receiver amplifier with volume control and push-to-listen switch, which decreases transmitter output and increases receiver output. Used primarily by Government Agencies for Security Reasons - To listen or talk it is necessary to depress a button in the middle of the handset. Intended for specially engineered lines - not for general telephone use. These handsets are factory sealed units. If either handset or cord was defective, both were replaced as a unit. G10A and C: two buttons on handle control receive and transmit separately. C has an H6F cord with 425A plug. G10B and D: single button controls both functions simultaneously. D has an H4DD cord with 396A plug. There are several button configurations. Most found sets are marked simply G10 with no suffix. The suffix is on the box, so an installer replacing a defective unit knew what is being installed. Several handsets have been found marked G10F (beige single button photo). 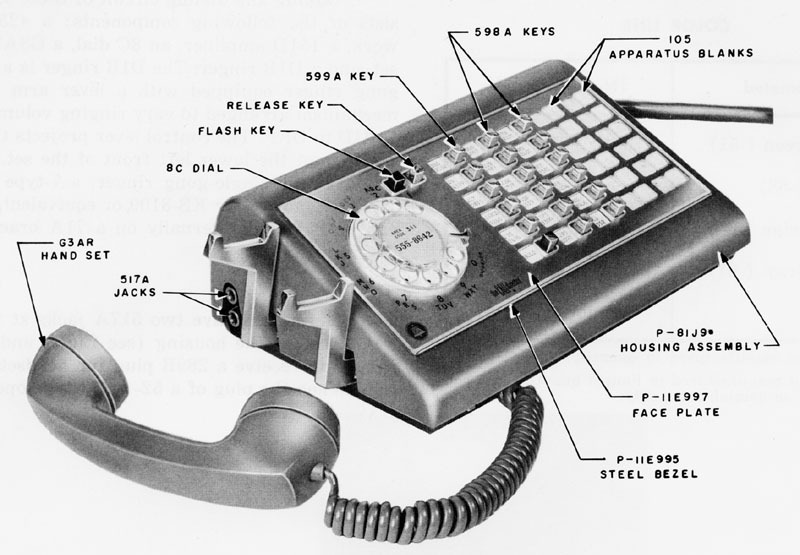 G11 "Used with 15A, 15B and 15C apparatus which are part of 520A, 520B and 2520C explosion-proof telephone sets. Designed to provide protection against the probability of explosion resulting from flames originating within the handset under extreme conditions of operation." (Makes you wonder about the rest of the handsets, doesn't it?) T3 transmitter, LA1 receiver, aluminum lined cavities. Uses H4DB cord with Trimline-style plugs. Provides amplification, like the G6B, except uses a slide switch instead of a potentiometer and has an armored cord (G13A and G13B). Switch provides 10 or 20db gain and spring returns to normal position (0db). Available in -52 gray. 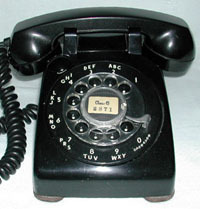 Later G13D handsets used two pushbuttons. Push and hold either for 10db or both for 20db gain. Available in -52 gray or -104 chocolate brown. Caps are ultrasonically bonded to the handle, therefore components cannot be replaced. 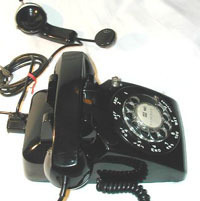 The handset and cord are replaced as a unit. 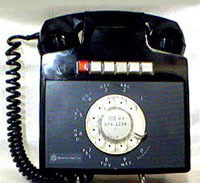 Basic handset with modular connection. Replaced G3 for modular applications. Replaces original handset where 3db transmission gain or low current operation is required. (Only works with rotary dials or touchtone dials equipped with a common switch contact arrangement to prevent dial sidetone amplification, and is polarity sensitive.) 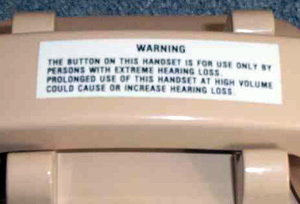 When installed, a sticker was placed on the bottom of the phone, "Equipped with G36 Handset", as there are no user controls visible to indicate the presence of the amplifier. Receiver-amplifier unit and polarity guard. Pushbutton provides an additional 10db gain in the receiver and 10 db loss in the transmitter circuit. 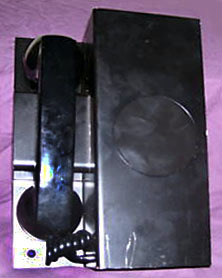 This handset is intended only for use by customers who require more receiver gain than that provided by G6 type handset. Recommended in place of the D-180413 handset. This is actually a receiver that looks like a G3 handset. Used with 8A and 9A announcement systems (to record the message), or as part of a high fidelity conference set. Link to similar info on F Handset Models. 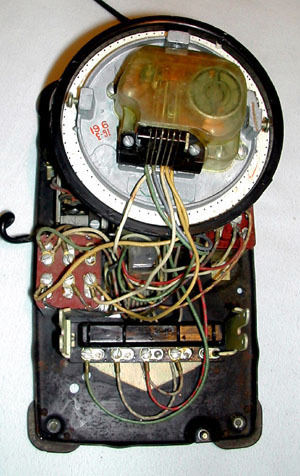 Note: Early models had separate cord retainer parts in the transmitter cavity. Later models had the retainer molded into the transmitter cup. The parts are not interchangeable. Donation of photos (or actual phones) is greatly appreciated. Thanks to ATCA and TCI members, including: Rick Walsh, David Massey, Jeremy Walters, Todd Bernstein, David Willingham, John Chalupsky, Steve Hilsz, Steph Kerman, Stan DeOrsey, Steve Schlink, Jonathan Sowers and Vern Potter.